Bud Browne, a onetime Venice Beach lifeguard who became known as "the father of surf films" after he began showing his 16-millimeter surf movies commercially up and down the California coast in the early 1950s, has died. He was 96. Browne died in his sleep Friday at his home in San Luis Obispo, said his close friend Anna Trent Moore, daughter of surfing legend Buzzy Trent. "Bud created the genre of surf films," Steve Pezman, publisher of the Surfer's Journal, told The Times on Monday. "What was unique about Bud and his films was the water footage, and the fact that he lived with the surfers he was filming. "All those surfers actually just loved the guy, and he was a great athlete himself." A former captain of the USC swim team who learned to surf while working as a lifeguard at Venice Beach in 1938, Browne bought an 8-millimeter movie camera two years later and began making home movies of his fellow surfers. In 1947, after serving in the Navy during World War II, he upgraded his camera to a 16 millimeter Bell & Howell and got more serious about shooting the action on the waves, particularly during his annual trips to Hawaii. Several years later -- after working as a middle-school physical education teacher and attending the USC film school -- Browne had enough footage to edit into a 45-minute movie. With handmade posters nailed to telephone poles near local surf spots, he debuted his first film, "Hawaiian Surfing Movies," at John Adams Middle School in Santa Monica in 1953. Browne, who charged 65 cents admission, introduced his film onstage, then hurried back to the projection booth to narrate it via microphone with taped musical accompaniment. A couple of other successful beach-town showings followed, and Browne gave up teaching to launch his career as a surf filmmaker. Between 1953 and 1964, he released a new surf film each year, including "Trek to Makaha," "The Big Surf," "Surf Down Under," "Cat on a Hot Foam Board," "Surf Happy" and "Gun Ho!" In the process, he captured on film longboard-era greats such as Phil Edwards, Miki Dora and Dewey Weber and first-generation shortboard heroes, including David Nuuhiwa and Gerry Lopez. Browne, who shot big-wave action from the water with a waterproof camera housing of his own design, was known to be fearless. "He was completely at home in the water," Matt Warshaw, author of "The Encyclopedia of Surfing" and a former editor of Surfer magazine, told The Times on Monday. "With a camera cased in housing, he was willing to go out and take lumps and get angles no one else wanted to get." In a 2005 column in the Orange County Register, surfing champion Corky Carroll recalled "running over" Browne one day at Pipeline in Hawaii. "He told me to surf like he wasn't there, so I did," Carroll wrote. "I am tucked deep into this monster barrel, and there is Bud, right in the way, filming me. I figured that he was gonna dive under before I ran him down. Wrong. He just stayed right here filming, and I took him out like a Greyhound bus nailing a highway dog." As a surf-film pioneer, Browne predated other early surf filmmakers such as Bruce Brown, Greg Noll and John Severson. Brown, whose film "The Endless Summer" became a phenomenon after opening nationally in 1966, remembered watching Browne's films as a teenager. In fact, Browne captured him on film surfing in Hawaii. "That was a big deal to go to Bud's movies and to see if you were in it," Brown told The Times on Monday. He held Browne in such esteem as "the originator" of commercial surf films that "when I got a chance to make one of my own, I went to Bud and said, 'I don't want to do it without your blessing.' He said, 'No problem; go for it.' "
Warshaw said the work of Browne and other early surf filmmakers was, to surfers, the equivalent of passing around a scrapbook. "When Bud first came out, there weren't even surf magazines," he said. "Everyone was so starved to see imagery of surfing." Nicknamed "Barracuda" for his tall, slender build and the amount of time he spent in the water, Browne was known as a top body surfer. In the early '60s, he was famous for body surfing at the Wedge in Newport Beach, the most dangerous body-surfing spot in California. As a filmmaker, Pezman said, Browne "made a film record of the surf culture that he was intimate with. "He was allowed inside as one of them, even though he was quite different than they were," Pezman said. "He was a traditional, old-school gentleman, and they were rambunctious rebels, but somehow they coexisted, and he recorded their lives and their culture as it expanded from a few hundred [surfers] in the '50s to several million in the '60s, and he and his films helped fan the flames of that growth," he said. Warshaw said Browne retired for a while in the mid-'60s, then came back in 1973 with what many consider his best film, "Going Surfin'." 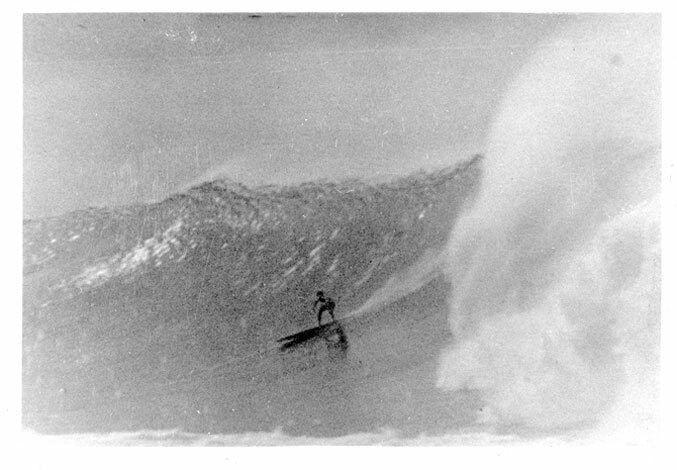 Browne also shot footage for Greg MacGillivray and Jim Freeman's 1972 classic "Five Summer Stories" and was part of the team that filmed the surfing sequences for "Big Wednesday," director John Milius' 1978 feature film. Born in Boston on July 14, 1912, Browne moved to Los Angeles in 1931 to major in physical education at USC. Browne, who lived in Costa Mesa for many years before moving to San Luis Obispo three years ago, was inducted into the International Surfing Hall of Fame in 1991 and the Huntington Beach Surfing Walk of Fame in 1996. He was honored in March at the San Luis Obispo International Film Festival for his contributions to surf films. Moore, who said Browne remained active until he developed health problems due to diabetes, recalled that she and Browne went on three bungee-jumping trips to New Zealand together in the 1990s. "He loved to bungee jump, and he bungee jumped until he was 86," she said. Browne, who never married, is survived by two nieces and a nephew. At Browne's request, close friends will scatter his ashes at Pipeline on Oahu. A celebration of his life will be held at 7 p.m. Aug. 25 at Waimea Falls. My head is full of details from speaking with old timers now long gone and a few surface now and then but many more are lost somewhere in the crevices of my grey matter. Like Lou Reed stated; "Unfortunately those memories are no longer available". Mary Ann told me before Bud had any commercial movies he would show his films either on a sheet, small screen, or the side of buildings in empty lots in Malibu and elsewhere just for a small gathering of friends. We know the popularity grew and what happened as time went on. Bud Browne (not to be confused with Mary Ann's first husband, Bud Morrissey) and Mary Ann dated as youngsters and Bud's mother drove them to the beach on at least one occasion. Mary Ann had a really nice photo of Bud at about age 15 when they were a semi item. I never did copy it and but I am confident her children have that small image. It looked like it was from a photo booth. Bud was a healthy good looking adolescent. Another bit of information to go back and review is the rare footage taken by Doc Ball of Bud Browne body surfing with a wet suit and inflatable matt at the pier (Hermosa?) The surf is large and the straight off drop is rather spectacular and the speed is intense for those that were not aware this is Bud Browne or have not seen that footage. 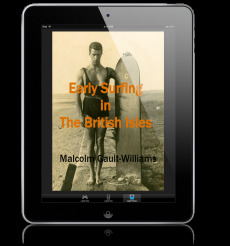 It shows a number of takeoff as well as Bud walking on the beach in his wet suit and with his surf matt. This footage predates Bud's work by many years. I believe it to be from the 30's. Probably the earliest footage ever of Bud. The homemade wetsuit is another fine pioneering effort by the watermen of the era.